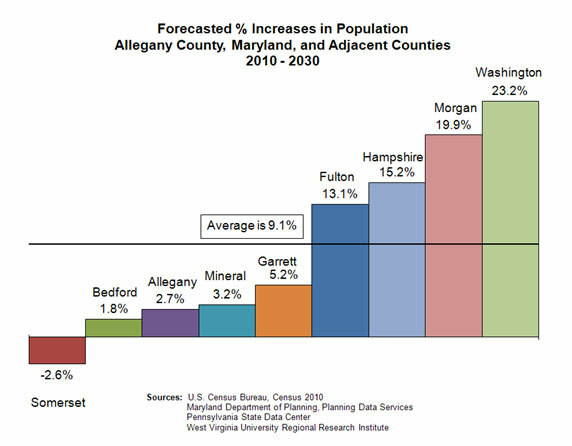 Allegany County is projected to have a 3% increase in population between 2010 and 2040. 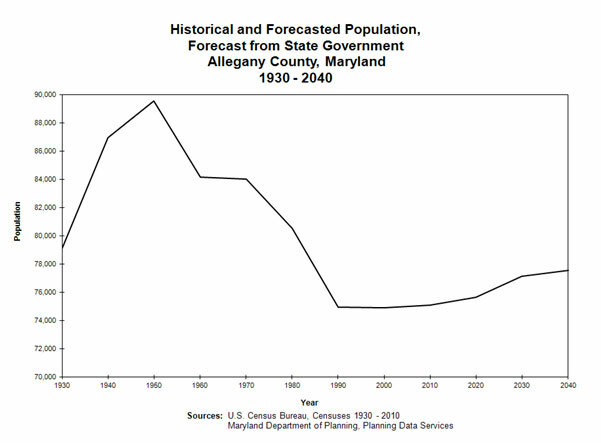 This is more dramatic than it sounds at first and is probably a conservative forecast because of the County’s historical population trend as the next chart shows. After four decades of population decline, the population has now been stable for two decades. The forecasted increase in population is based in part on the building net migration into the County as the next chart shows. The net migration trend shows that Allegany County is no longer suffering big losses and is on its way to having consistent gains. Specifically, Allegany County’s positive net migration is due to its interaction with other Maryland Counties. At the same time, the losses to other states are disappearing. 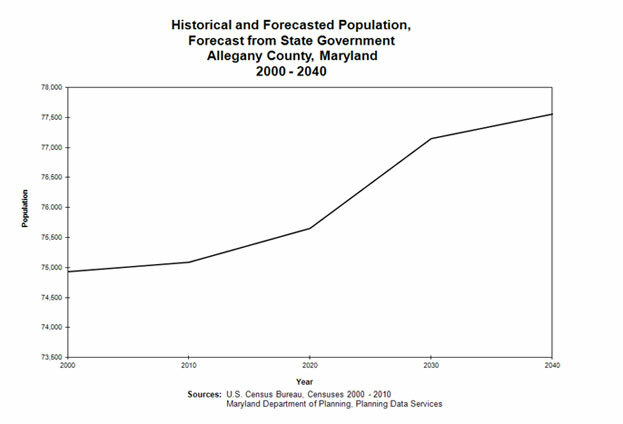 The forecasted increase in population for Allegany County is also based in part on the large forecasted increase for the region. The average for Allegany County and the eight adjacent counties is 9.1%. The Cumberland MSA consists of Allegany County and Mineral County, with the latter forecasted to increase 3.2%. 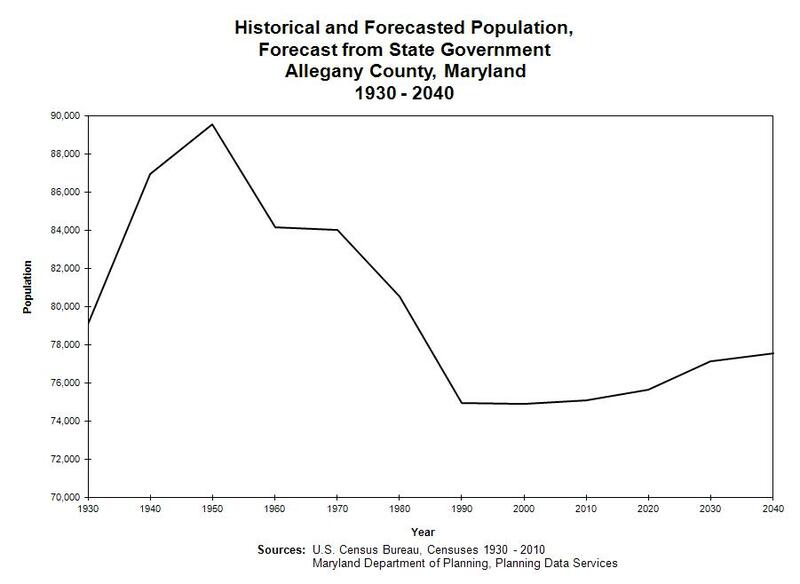 Garrett and Washington, Allegany County’s adjacent Maryland counties, are forecasted to increase 14.2% on average. According to the 2009 U.S. Census Current Population Survey, the reasons for moving out of a county are related to work, 35.5%, family, 26.6%, and housing, 24.3%. Allegany County attracts people for these three reasons. First, let’s look at work as a reason for moving to Allegany County. 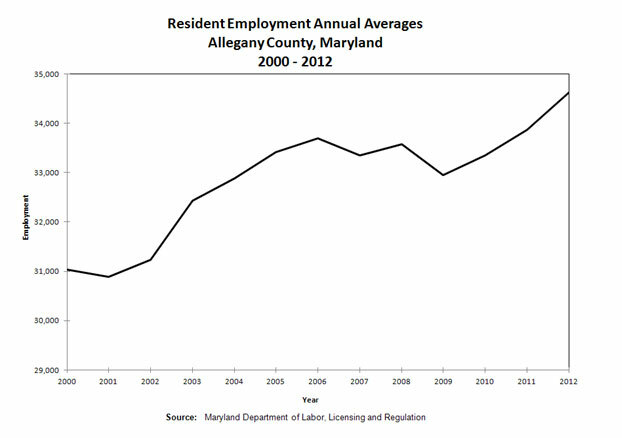 The recession impacted Allegany County’s resident employment, but the trend overall has been increasing. Resident employment has increased 12.0% from 2000 to 2012. In 1982, Allegany County’s annual unemployment rate reached a high of 14.3%. In 1992, however, the rate was 12.5%, and that’s when the rate was the highest compared to the rate for the United States. 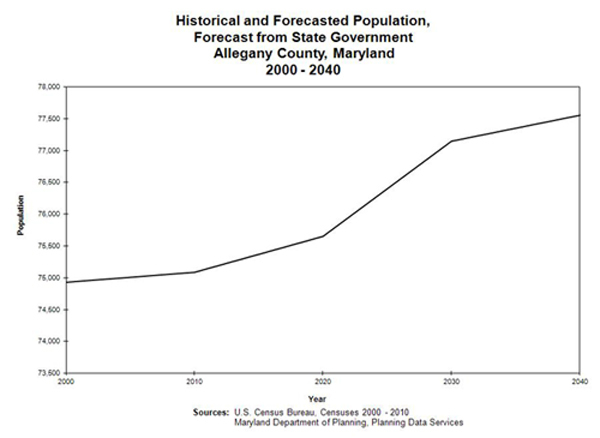 1990 was when the rate was highest compared to the rate for Maryland. Since that time, the gap between the county and the country narrowed until it disappeared altogether in 2008. Since 2008, the County’s annual rate has been below that for the country. The next chart makes it clearer. 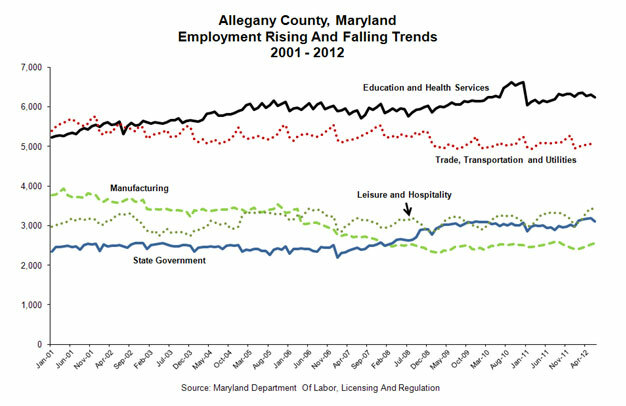 The unemployment rate for Allegany County has always trended more closely with that for the State of Maryland rather than that for the United States overall. For the past decade though, the County has become even less tied to the national economy. This doesn’t ignore that Allegany County is a subset of the state, and the state is a subset of the country. It is just recognition that the local economy has become more like the state’s rather than the country’s. The next chart shows how the local economy is changing. The Maryland Department of Labor, Licensing and Regulation has 13 industry sectors. 6 of these accounted for 78.9% of the employment in Allegany County in 2011. Of these 6, only one, Local Government had a flat trend. Therefore Local Government is not included in the chart above. It would place between Leisure and Hospitality and State Government. As the chart shows, Education and Health Services passed Trade, Transportation and Utilities as the leading industry sector for the County in 2002. Manufacturing has declined, going from third to sixth place. In 2006 it fell below both Local Government and Leisure and Hospitality, and in 2008 it fell below State Government. Leisure and Hospitality passed Local Government in 2002. Now let’s look at housing as a reason for moving to Allegany County. Allegany County has the lowest housing costs in the state of Maryland. 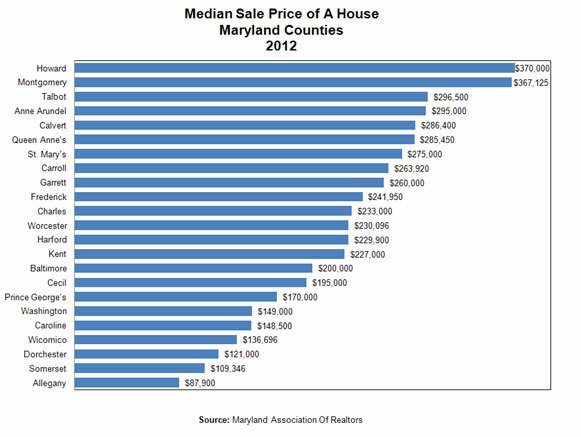 Housing prices in the County are only about a third of those in Maryland overall where the median sale price is $244,912. Also, they are only about half those for the country, where the median sale price is $176,800. 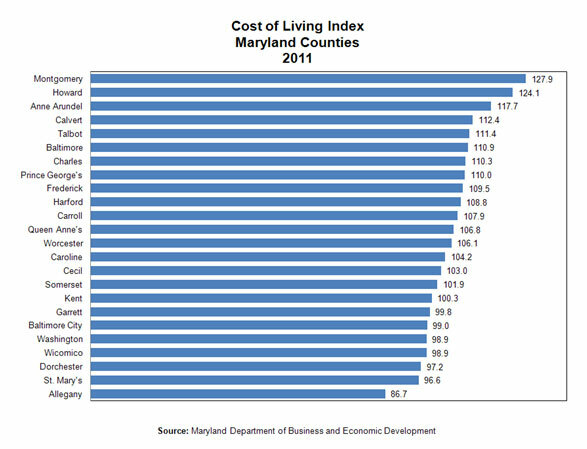 The lowest housing costs helps Allegany County have the lowest cost of living in the state of Maryland. Lastly, let’s look at family as a reason for moving to Allegany County. 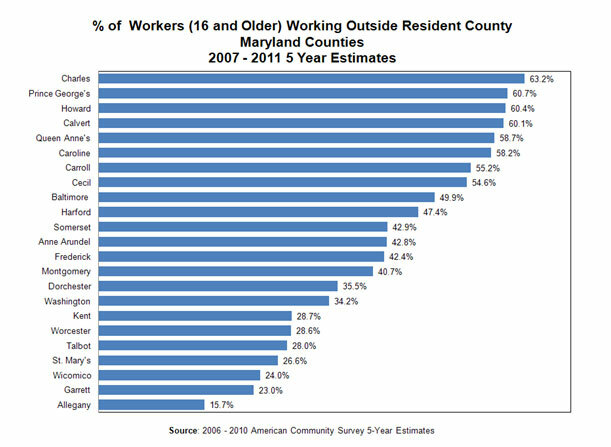 Allegany County has the lowest percentage of residents that commute outside their respective county in the state of Maryland. This helps the family by shortening the commute for those that work in the family. Even if they work outside the county, they are not driving on congested roads. 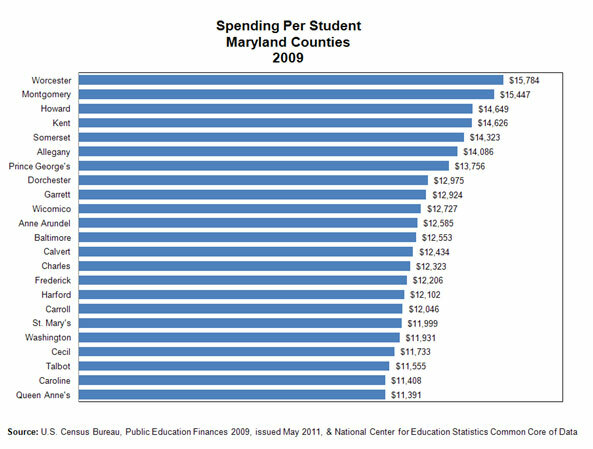 For public schools, Allegany County ranks 6th for spending per student out of 23 Maryland counties. Allegany County compares favorably by this measure to the most affluent counties in the state. 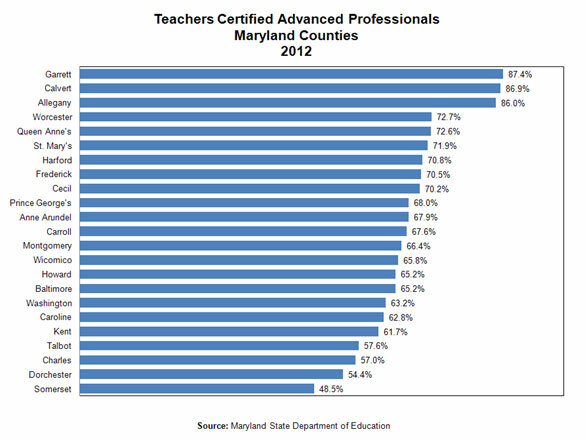 For public schools, Allegany County ranks 3rd for having state certified Advanced Professionals for teachers, out of 23 Maryland counties. The adjacent county of Garrett ranks 1st. Besides quality public schools, Allegany County is privileged to have two quality institutions of higher education; Allegany College of Maryland and Frostburg State University. Enrollment has already steadily increased at both. For the next decade, enrollment is projected to increase 16% at Allegany and 1.4% at Frostburg.